I am constantly being reminded by my better half that its strange that I can’t remember the simplest domestic detail about where anything is kept, but I have a photographic memory for obscure football results from the past and astrology charts. My feeling is that a Capricorn’s brain has a fairly limited amount of space available so why clog it up with things that she will remind me of anyway even if it does involve much rolling of eyes and disparaging comments. And if I don’t carry 25,000 + charts around in my head, who will make the connections with any new ones that come to my attention. Since my 2nd Saturn Return, I have to admit this capacity to remember vital details about every chart I’ve calculated has tended to fade, but occasionally you see a chart that is so startlingly similar to another that anyone would be brought up short. As regular readers of my articles will know, I have an unhealthy fascination for the astrology of murderers and am willing to spend inordinate amounts of time classifying them into different types. One type that has always intrigued me is people who murder members of their own family. Another point is that the Moon seems to play a larger part than with other killers. I have a collection of 38 charts of people who have murdered their parents and whilst this is too small a sample to come up with any statistically proven links, there are some interesting pointers. Just like with the larger collection of 545 Murderers, the Sun scores highly in Taurus, although Sagittarius is the most common placing. Perhaps its a freedom thing. On the other hand the Moon in Taurus scores more than twice the expected figure, which on the face of it is not what you’d expect, given this placing’s sense of comfort and ease in their home. However the Moon’s aspects are quite telling. In the larger group of general Murderers, the Moon is conjunct Saturn 133 % and conjunct Neptune 127 % of the expected figure. But the other conjunctions that the Moon makes are so low scoring as to bring the overall average below 100%. For the Parent Murderers, the Moons average figures for conjunctions are 136 %, oppositions 130 % and squares a massive 154 % of the expected figures. There is particular emphasis on the Moon square the Ascendant, square Venus, and oppositions to Mars, Saturn, Uranus and Neptune. As would be expected Mars’ aspects for Murderers in general score quite highly, particularly the conjunctions with Saturn and Neptune, but in the charts of these Parent Killers, Mars conjunctions are conspicuous by their absence. As previously stated this sample is too small to make any clear statements but there does seem to be certain differences between those who bump off their Mum and Dad and the rest. But there are occasions when the difference is so tiny that its very hard to spot. Ronald DeFeo Jr, in a crazed fit scarily depicted in the Amityville Horrors, murdered both parents and four siblings in November 1974. Now any astrological novice would be nodding their head at this one. A 5 planet stellium in the 8th house of death, including a violent Mars / Pluto conjunction is pointing an awful lot of energy in one direction. And it is a direction that has been spotted before. 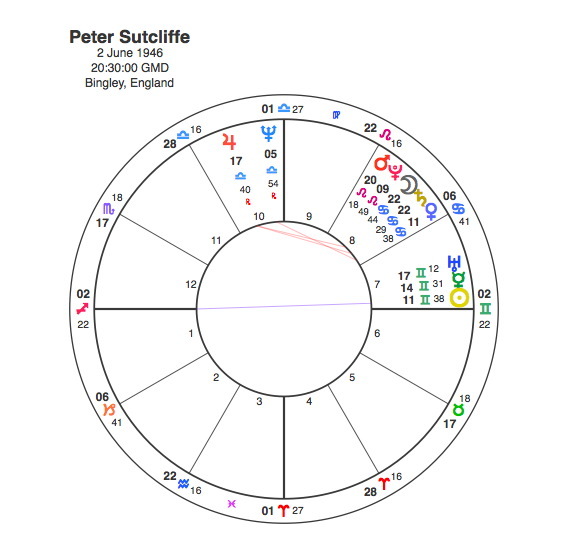 Peter Sutcliffe, the Yorkshire Ripper also has a 5 planet stellium in the 8th house including a Mars / Pluto conjunction in Leo. In fact swap De Feo’s Mercury for Saturn and it would be exactly the same. When I wrote Peter Sutcliffe – The Yorkshire Ripper, one poor soul responded to say that I should not have done so because he also had an 8th house stellium. At the time, I replied in as diplomatic a fashion as I could saying that the 8th house was a mystery and a stellium there could mean many things. But now I’m beginning to wonder, particularly if Mars and Pluto are involved. And anyway, do I have to place a rider on all my articles saying ” any resemblance between the charts being discussed and your own etc etc “. The one difference between Sutcliffe and De Feo is that the English monster killed prostitutes while the American murdered his family. Can we find that difference in the stellium ? Perhaps because the first planet involved conjunct the cusp of the 8th house is Venus ( women in general ) for Sutcliffe and the Moon ( his parents ) for De Feo. Sutcliffe’s murdering spree began in 1975 when Pluto was square to his Venus. De Feo’s occurred over a much shorter period of course but when Pluto was conjunct his Sun and Saturn. Maybe he killed his father first. The De Feo murders spawned a book and a film. I have to confess I made up the time of day for theatrical effect but the stellium would be the same whatever time it was published. 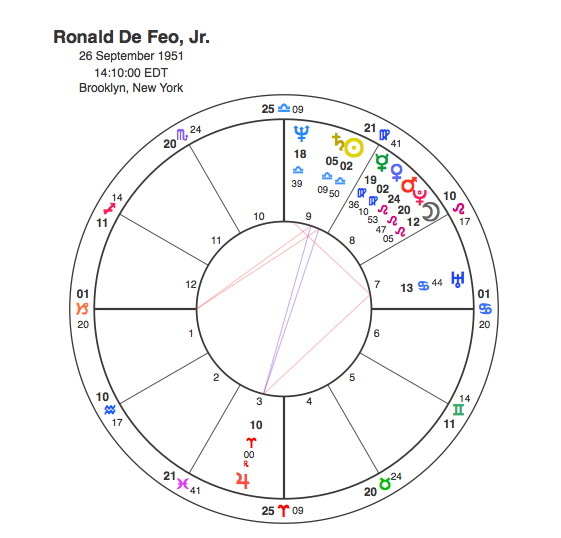 Not only is it a 5 planet conjunction but its also arranged over the pretty much the same degrees of the Zodiac as Ronald De Feo’s. Again I have selected the time to suit although I think its quite reasonable that the first showing of a film would be at 4.15 in the afternoon. Four of the same 5 as for the book with Pluto replacing the Moon. In the case of both the book and the film, Venus is the first planet closest to the 8th house cusp. And in both cases Venus is in aspect to Neptune. Bloody stelliums, they seem to follow you round the room. This is the trouble with overdoing your astrology research, it can feel like you’re being stalked. Perhaps I should get my occultists’ psychic self defence kit out, if only I could remember where I put it. 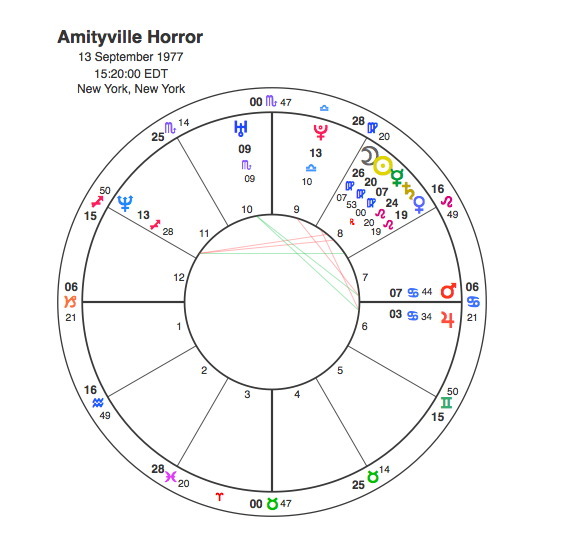 This is the first internet post I have seen on The Amityville Horror, and fascinating for a personal reason. A couple of years ago I experienced an adverse physical reaction (most likely an anxiety attack) after watching a documentary made by one of the Lutz sons detailing his time in the house at Ocean Avenue. Prior to this I had been reading a number of internet articles about the controversy surrounding the book and all about the claims and counter claims made in connection with what allegedly happened there. I have Sun, Mercury and Mars in the 8th House so I’m not sure whether I was picking up on any energies whilst watching the documentary. If the Lutz son was being honest then it would have to stand out as a most bizarre haunting and one that fills me with a sense of foreboding. Thank you Ian. 8th house people are often very sensitive to stuff like this. Would you mind saying what sign your Sun / Mercury / Mars are in ? Thanks. As you said yourself, very sensitive to those kind of energies. Was there also speculation that the hauntings were in some way connected to occult activity? That would certainly make sense in view of the 8th house emphasis. Have you ever looked at the unsolved murders in a small German hamlet called Hinterkaifek ? There is online discussion and information from original investigation to have, although the best page is in German language. I drew the charts of all people involved and have an opinion but the puzzle is very intriguing. In recent years the murders have been made the study object for German Police detectives for their qualification and still there was no conclusive outcome. I would love to read your take on the Astrology of this 30 March 1923 when 6 people of a family were slaughtered with no firm lead let alone a conviction to this day. Thanks for that one. I’d never heard of it before. 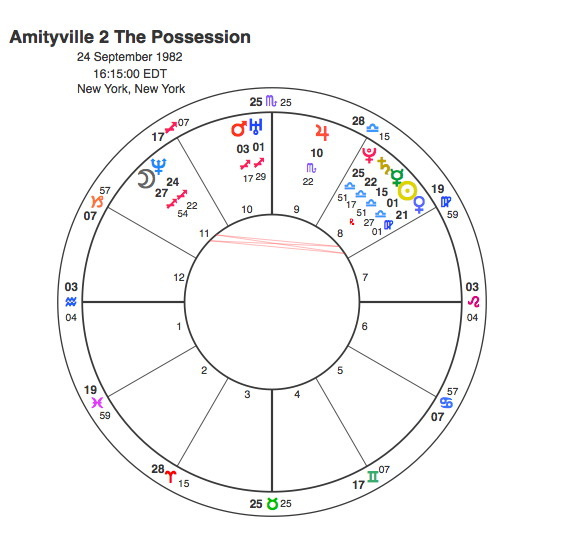 The chart for the murders is pretty grizzly with a Sun / Saturn apex Pluto T-square. I’d be intrigued to see the charts of all involved. I’m interested in where/how you got the birth time for Ronald DiFeo. I have a personal connection to him in that we attended the same private Catholic elementary school in Brooklyn. I was in the grade ahead of him and his older cousin was one of my classmates. I attended the all girls’ high school that was attached to the elementary school and that high school produced three working astrologers. Thanks Madalyn. I get all my research charts from the astrodatabank. Thats fascinating about your school. Thank you! I had an unfortunate experience with him and his cousin. If you are interested in hearing about it, you can email me. No big deal but perhaps an insight into the workings of a very sick mind.